* 'A' Series (post-1951) & Kerryl (post-1956). Most Remued pieces belong to either the Early Series or the Later Series. Other series are easy to identify - Pamela is Pamela because it says 'Pamela' on the base (the occasional unmarked Pamela shape notwithstanding). Equally straightforward are the 'Alphabet' Series, the 500 Series and the 'A' Series. So the problem of identifying series essentially comes down to "How do we distinguish between Early Series and Later Series?" * If there's a legible number, it's easy. If numbered 200 - 490 it must be Early Series. Below 200 it could be either Early or Later. Look first at the Later Series under 'Catalogue by Number' because for the Later Series, every number is catalogued. If it matches there - bingo! If not, then by default it must be Early Series. Check the Early Series for confirmation. * If it's numbered but the number is unclear or illegible, try 'Catalogue by Shape' and the date indicators below. - it could be a later piece that accidentally missed out on numbering or was for some reason outside the normal numbering systems. To help decide which, try 'Catalogue by Shape' and the date indicators below. Knowing which numbering series a piece belongs to places it within a date range, although it should be emphasised that some of the ranges listed above are still somewhat tentative (see 'Evidence for dating the numbering series'). Within the Later Series, numbering allows the range to be further refined. Besides the numbering, however, there are various other pointers to a piece's date. For the most part no one pointer is definitive by itself, but taken in combination they can often indicate fairly precisely the period of manufacture. An incised date of course provides the easiest, most reliable and precise date indication of all. Unfortunately the practice existed for only a very limited period. Some Remued pieces from 1933 and 1934 have incised dates. 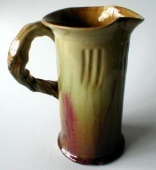 The majority of Pamela pieces are dated, incised 1934. The event being commemorated gives the date. The most common is the centenary year of Victoria, 1934. (At the time, the centenary of Victoria and the 1935 centenary of Melbourne seem to have merged into one.) There are also rare examples celebrating the 1934 centenary of Portland which pre-dates Melbourne as Victoria's first enduring European settlement. Another event commemorated was the accession of King Edward VIII in 1936. These pieces are not dated but can be firmly assigned to 1936 because Edward's reign began and ended in that year. There are two patterns of Remued foil stickers. The earlier reads 'Hand Made, Remued, Australia'. The later omits the word 'Australia'. The change appears to have occurred early in the war years, near the end of the Early Series period, with a period of overlap between the two patterns. Some Early Series pieces display the newer sticker and a few Later Series pieces have the older one, but the great majority of Early Series pieces (if they have a sticker at all) have 'Australia', and Later Series stickers almost always lack 'Australia'. The few recorded 500 Series pieces that have stickers all lack 'Australia'. Edward VIII jug from 1936. It may be noted that there was also a 'Pamela' sticker, a rarity today. It is not significant for dating. Even rarer, there was also a red-and-white PPP sticker (no image available); and the mystery 'Ascot' sticker. Some pieces have incised vertical striations on the side. This is diagnostic of a very early manufacture, from 1933-1934 before Early Series numbering. Possibly a feature introduced by David Dee and not continued by Allan James. Applied twig-handles or branch-handles are such a sought-after feature that the term is sometimes used indiscriminately for any handle at all. Of the various styles of handles though, only two can really claim the name, and they provide a useful date indicator. 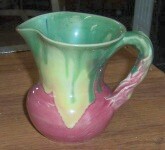 This is found almost exclusively on jugs - items that of necessity have a handle - not as added decoration on vases. It is of more-or-less uniform thickness, and slightly twisted with irregular longitudinal ridges and grooves. It is a very early feature, generally only found on pieces that pre-date the Early Series numbering - hence 1933-1934. Some time during the course of the Early Series - not at the very beginning - a new type of twig-handle appeared and became a characteristic Early Series feature. 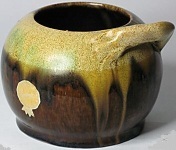 It is more irregular than the previous shape, often bifurcating, and was applied to all manner of items - baskets, pots, vases and dishes as well as jugs. Many shapes are found both with and without these twig-handles. By the end of the Early Series range however they had disappeared, with none recorded from 400 onward. In the Later Series they are almost totally absent (exceptions are the 91 H dishes, the 162 vase, and the small Later Series 500 range). So, if a piece has a twig-handle of this later pattern, its date can probably be narrowed down to 1935-1941.